Thank you Elon Musk for giving Hungarian citizens a possibility to economically refuse the planned new Russian Nuclear Power Plant that the idiotic Hungarian government is planning to build in Hungary for exorbitant amounts of borrowed money (borrowed from the Russians of course… while people have no jobs…). When a political election did not stop the nuclear power plant idea (it did not), when the EU is impotent to stop it (it is), you can always count on Elon Musk​ to do something that changes the game and gives even individuals power in every sense of the word! TESLA’s home (and industrial) solar energy storage technology is already something that the middle class could afford even in Hungary and without government subsidies. (Because never expect this government to support something that makes sense… in present and in future tense.) Imagine people building new homes, purchasing solar panels, a TESLA POWERWALL, and living off the grid from the first day in their new houses… no need to have a contract with a utility company that provides more expensive, nuclear power based electricity or “natural” gas… It is a smart investment economically and ecologically to spend money on a PowerWall (eg. : at home) or on a PowerPack (let’s say, by the II. district in Budapest). These batteries (their industrial versions) will also enable small and local energy businesses, even local governments to provide extremely affordable day and night Solar based electricity to financially less powerful clients. And I could go on and on about how it is a good idea to build this technology into existing homes and institutions as well… And we would have cleaner air as well… because heating homes with fossil fuels is one of the major sources of pollution… as are exploding and burning nuclear power plants… And how about finally running air conditioners with Solar energy (day and night). I am for the TESLA POWERWALL. I support the TESLA POWERPACK! My secret dream: Elon Musk for Hungarian president… or at least a similarly intelligent and talented person. Game change: on! And the punchline: 2 billion PowerPacks could make the entire world 100% Solar and renewable powered within a decade or two, and Tesla has a factory sized product for this: The TESLA GIGAFACTORY (that is obviously powered by renewable energy and Tesla PowerPacks). This technology is also especially useful for off-grid uses to store small scale solar and wind power. There are also larger scale liquid batteries being developed that can store two to three megawatt hours of current that can power many homes at night or when the wind is not strong that is drawn from industrial scale renewable sources that is becoming more common. A good primer is this TED talk at http://www.ted.com/talks/donald_sadoway_the_missing_link_to_renewable_energy. In the technology discussed in the TED talk, “thermal runaway” is said to be less of a concern than it is with the lithium ion battery technology. Now, the problem with Sadoway’s battery (even 3 years after his TED talk and even after an angel investment from Bill Gates) is that it is still huge and very heavy. Not ready for household use at all. 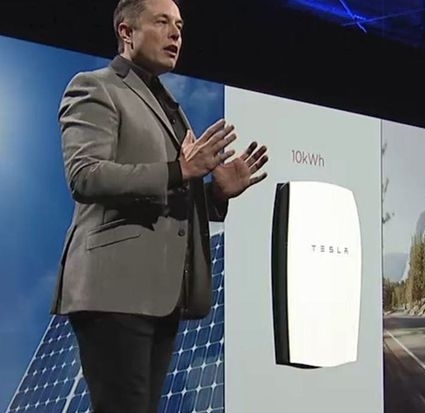 Elon Musk’s Tesla PowerWall battery is perfect for home use right now when charged and cooled with solar energy. You are focusing on grid storage and balanced power delivery on a large scale. I am talking about affordable local and home solar energy storage for less sunny days and dark nights.